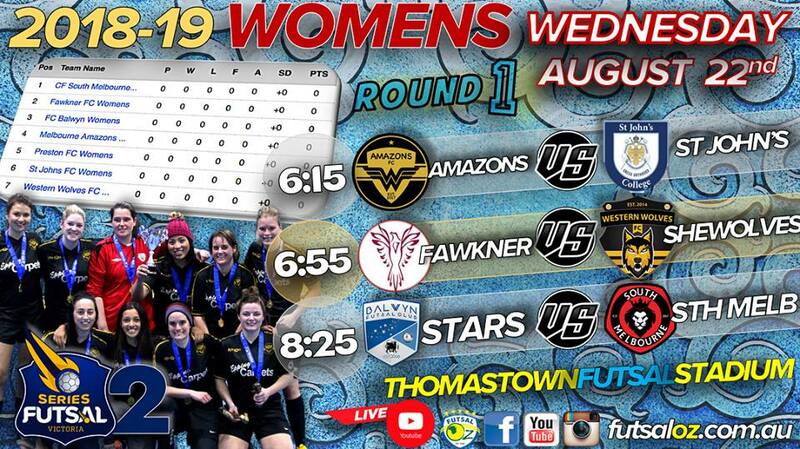 First game for the season for St John’s and first game for the new Series Futsal 2 Women’s league. Melbourne Amazon aiming to start their season the same way they ended last season with a win. New season, new uniform and a new playing team, makes for an exciting season for both clubs. Melbourne amazon able to get their season under way early. With two quick goals to Bianca Lee giving them an early lead in the game. With the crowd behind them St John’s able to get their first goal. Both keepers kept busy in the first half, with shots been taken from anywhere. St John feeling the pressure late in the first half but their defence held up well. Second half commences and both teams want to end this half in front. St John fire up in the second half and really putting the pressure on Amazons defence. Amazons counter attack keep them in the game and help them extend their lead as Bianca Lee again scores 2 goals. With 10 minutes remaining in the game St John able to get their second goal for the game. With the crowd cheering on the St John team continue to keep their heads held high and keep on pushing. St Johns improving with every minute in the game but can’t seem to stop Bianca Lee, she went on to score her fifth goal for the match. Putting on a one woman show in front of goal for Amazon. With one minute remaining Bianca Lee again no stoping her scores her sixth goal. What a game from her. Amazons start this season with a win. New team in Series Futsal Victoria 2, Fawkner making their debut. Western Wolves trying to go one better from last season. Western Wolves able to get the first two goals in the back of the net. Putting the pressure on Fawnker’s defensive structure. Fawkner going down to 3 players for about 5 minutes in the game saw Western wolves take advantage of the situation however they didn’t convert their chances. Wolves continued to press and push hard when going forward. They just struggled to get some reward for effort. Fawkner gaining their fourth player and put the pressure on. They counter attacks were good. They just struggling to have shots on target, most would go over the cross bar or it was far to easy for the keeper. At half time Wolves found themselves 3 nil up. Western Wolves able to get the first goal for the second half. Extending their lead out to four goals. Making it really hard for Fawkner to come back from. Fawkner’s defence continues to hold up well under pressure. Wolves continuing trying to find space and have shots on goal. Eventually getting some reward for effort and scoring their fifth goal for the game. With one minute remaining Wolves again able to find the back of the net. South Melbourne new to Series Futsal Victoria they took on Balwyn. Play begins and South Melbourne get the first goal for the game. Putting some pressure on Balwyn defence and keeper. Balwyn continue to dig deep in the first half and are able to find some shots on goal just struggle to find the back of the net. Balwyn’s counter attack is strong and continue to push hard. At half time 1 nil South Melbourne in front. South Melbourne proved too strong in the second half as they added five goals to one, with Corina Jayasekera the star of the show scoring a hat trick whilw Rachel West & Angela West both added goals against their former side to start their season on the front foot.